Elizabeth Brown was born 6 July, 1843 in Stirling, Rawdon Twp., Hastings Co., Ontario, she was baptized 14 Feb. 1844 at Saint Thomas Anglican Church in Belleville. Please note that this post was inadvertently published about two weeks ago unfinished. If you received a copy of that unfinished post please discard it and replace with this updated and finished posting. Sorry for the inconvenience. Elizabeth married Thomas Bateman who was born 18 June, 1837 in County Cork, Ireland. 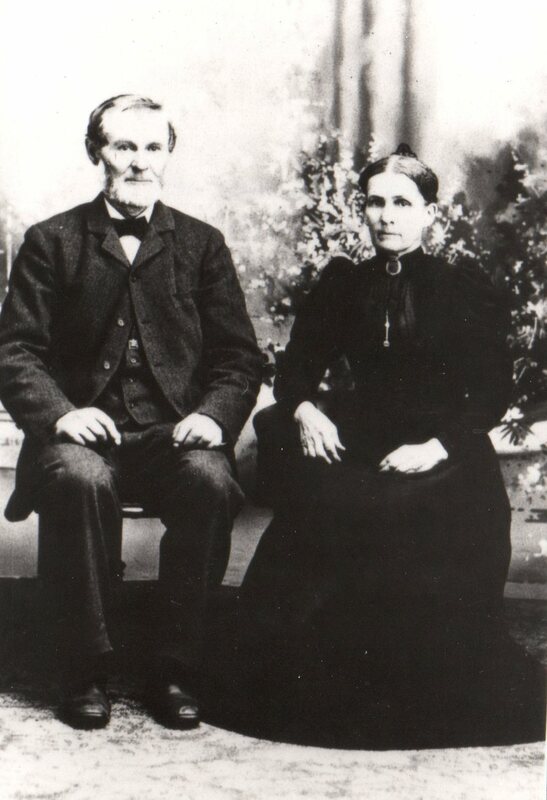 They married on 3 November, 1864 in Toronto, York Co., Ontario according to another researcher. Elizabeth is featured in the 1861 Canadian Census with the Thomas Vance family, along with her mother, siblings and half-siblings. I have posted about this census in recent posts. In 1871 Thomas and Elizabeth were in Rawdon Twp., Hastings Co., Ontario. Line 12, 43, 47, Bateman, Thomas, M, 34, Ireland, All C of Eng., All Irish, farmer, married. Line 18, 48, Bateman Samuel M, 77, Ireland, Ch of E, Irish, Farmer, Married, Bateman, Jane, F, 73, Ireland. Source: 1871 Canadian Census, Rawdon, Hastings Co., Ontario, page 13, 62 N. Hastings. By 1880 Thomas and Elizabeth had made the migration to Illinois and you can see from the information below the children born in Canada and the ones born in Illinois. Piatt County is east of Springfield, Illinois and after the city of Decatur. Line 23, 51, 53, Bateman, Thomas, W, M, 42, married, Farmer, born Ireland, parents born Ireland; Bateman, Elizabeth, W, F, 36, wife, married, Keeping house, born Canada, parents Ireland; Bateman, Thomas, W, M, 14, son, S, born Canada; Bateman, Jane, W, F, 13, daughter, S, born Canada; Bateman, Mary A. W, F, 11, daughter, born Canada; Bateman, Samuel, W, M, 9, Son, S, born Canada; Bateman, Frederick, W, M, 7, son, S, born Illinois; Bateman, Elizabeth, W, F, 5, daughter, S, born Illinois; Bateman, John R, W, M, 3, son, S, born Illinois; Bateman, Margaret, W, F, 6/12, Dec. daughter, S, born Illinois. Source: 1880 U.S. Federal Census, Blue Ridge Twp., Piatt Co., Illinois, page 6, SD#5, ED#176, enumerated 2 June 1880, Thomas Jones. 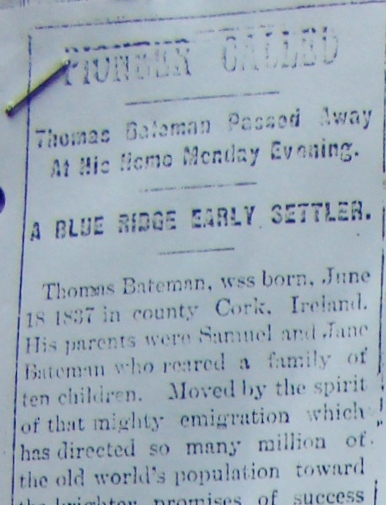 Line 42, 178, 181, Bateman, Thomas, Head, W, M, June 1837, 62, M, 35, born Ireland, parents born Ireland, farmer, 154; Bateman, Elizabeth, wife, W, F, July 1843, 56, M, 35, eleven children born, 11 alive, born Canada (Irish? ), parents born Ireland; Bateman, John R, son, W, M, Feb. 1875, 25, S, born Illinois, father Ireland, mother born Canada, farm laborer; Bateman, Etta, Daughter, W, F, Dec, 1879, 20, S, born Illinois, servant; Bateman, Lillie, Daughter, W, F, Jan, 1882, 18, S, born Illinois; Bateman, Edna, Daughter, M,F, Mar, 1884, 16, S, born Illinois; Bateman, Harry, Son, W, M, April 1887, 13, S, born Illinois. Source: 1900 U.S. Federal Census, Blue Ridge Twp., Piatt, Illinois, SD#7, ED#126, Sht 10, enumerated 12 June 1900, Jesse W. Klinger. In the 1920 census Elizabeth age 76 is living in Blue Ridge, Piatt, Illinois on South Street, she is widowed and naturalized. Living with her is Etta, age 40, a daughter. Also living with her is Lelia, age 20, granddaughter born about 1900. Elizabeth and Thomas had the following children based on the census above and other researcher contributions. 1. Thomas Bateman Jr. born 14 Nov, 1865/66 near Toronto. He married Cora Slater on 16 March, 1892/3. She was the daughter of William Slater and Mary R. Lyons. She was born 2 May, 1872. Thomas died 17 December 1939 and Cora died 26 Aug, 1905 in Mansfield, Illinois. They had one son a William Bateman born 28 January, 1893 in Blue Ridge Twp. who married Irene Vance 28 January, 1893 in Farmer City, DeWitt Co., Illinois. He died Feb 1933. William and Irene had three daughters. Line 19, 49, 50 Bateman, Tom, Head, M, W, 43, M2, 2, born Canada, Immigrated 1873, Naturalized, Farmer, general farm; Bateman, Flora, wife, F, w, 35, M1, 2, one child born 1 living, born Illinois, father born Ireland, mother born Ohio; Bateman, William, son, M, W, 16, S, born Illinois. Bateman, Lucile, daughter, F, W, 14/12, born Illinois. Source: 1910 U.S. Federal Census, Blue Ridge Twp., Piatt Co., Illinois, SD #18, ED 148, Sht #3A, enumerated 20 April, 1910, Frederick A. [Nash]. Thomas and Flora Bateman had Callie Bateman born about 1913. She appears in the 1920 U.S. Census for Piatt County along with William and Lucile. Thomas Bateman Jr. is featured in the book: Past and Present of Piatt County etc…, by Charles McIntosh, 1903, pages 383 to 384. This book can be found at Internet Archive and is pretty detailed about the rest of the Bateman family. Thomas and his second wife Flora are buried in the Farmer City Cemetery in DeWitt, Illinois. Cora Slater Brown, his first wife, is buried in the Mansfield Cemetery. Find A Grave has a picture of Cora’s tombstone at the Mansfield Cemetery along with other Bateman stones. William and his sisters are buried in the Maple Grove Cemetery in Farmer City, Illinois. Find A Grave has memorials for all three of these children but no tombstone photos at this time. 2. Jane (Jennie) Bateman was born 25 May, 1867 and died 2 July, 1934. She married an Alvin Thomas Smothers 7 November, 1889. Alvin died 25 December, 1935. They had one child: Edith Smothers. Find A Grave has the tombstones for the Smothers family at the Mansfield Cemetery in Illinois. 3. Mary Ann Bateman born 29 July, 1869 and died 24 April, 1944. She married an Enoch Chase on 7 September, 1887. They had the following children: Frank, Clyde, Clair, Myrtle, Lucas, Eleanor, Ruth and Gladys. Mary and Enoch lived in Tonkawa, Oklahoma. They are buried in the Tonkawa IOOF Cemetery, in Kay County, Oklahoma.  Find A Grave has photos of their tombstones. There may be another son named Elmer E. born 1896 to 1911. 4. Samuel Bateman was born 1 April, 1871 and died 13 October, 1940. He married and was widowed by 1900. The name of his first wife is not clear. In the 1910 census he is with his second wife Belle and children, Bernice, Frank, Edwin and Lois. Abner is missing and he and Bernice are probably the daughter of the first wife. 5. Charles Frederick Bateman was born 13 February, 1873 and died 12 February, 1908. He was married to Ella by the 1900 census and they were living in Bellflower, McLean Co., Illinois. They may have had two children: Elwood and Ella. 6. John Russell Bateman was born 6 February, 1875 and he married Anna B. Firke (b. Feb 6, 1879, d. 16 Sep. 1911). She is buried in the Mansfield Cemetery in Piatt Co., Illinois. John R. Bateman is inscribed on this tombstone but there is no death date. The FAG#23119360 in the Mansfield Cemetery was added 9/4/2016 and I prepared this post in 2015. John R. is buried in Pritchard with his second wife Lena, see below. In the 1910 census John R. Bateman is living in Rocky Ford, Otero Co., Colorado with Anna and John R. Jr.
By the 1920 they had Eleanor, Florence, Byron and were living in Mt. Pleasant, Isabella Co., Michigan on Franklin St. The name for John’s wife is Lena in this census. In 1930 they were living in Seville, Gratiot Co., Michigan with Elenor, Florence, Byron, Eugene, and Edwin. John R. and Lena are buried in the Pritchard Cemetery in Elwell, Gratiot Co., Michigan. John’s dates are 1874 to 1953 and Lena’s are 1879 to 1956. Find A Grave has a picture of their tombstone #40399826. UPDATE 6/4/2017: The information above about John Russell Bateman has been updated based on new information received from a cousin and verified with bible records. It is now believed that John R. was married twice first to Anna and then to Lena. 7. Elizabeth Bateman was born 28 October, 1877 and died 31 October, 1947. She married Layton Smith. In the 1900 census they are in Bellflower, McLean Co., Illinois. They had married in 1899. Layton was born June 1876 and is 23. He was born in Illinois, his father was born in Ohio and his mother in Indiana. He is farming. In 1910 they are still living in Bellflower, McLean Co., Illinois and they now have LuVerne age 6, and Delas age 4 male. Elizabeth has listed that she has 3 born and 2 living children. In 1920 Layton and Elizabeth have made the migration to Union, Van Wert Co., Ohio. They have Luverne E. with them and Delmar V. Also in the household are Pauline L. Stulz, Ruth M. Magruder and Merle E. Whitlock. The last three are listed as Boarders. Find A Grave has a memorial to Layton D. Smith 1876 to 1945 and one for Elizabeth Smith with the dates of 1877 to 1947, but no tombstone photos. They are at the Woodland Union Cemetery in Van Wert Co., Ohio. 8. Margaret Etta Bateman was born 23 December, 1879 and died 29 August, 1945. She had one daughter named Lelia. Etta is with her mother in the 1920 census and her daughter Lelia. Etta is buried in Mansfield Cemetery and Find A Grave has a photo of her tombstone and an obituary notice. Apparently she did spend time in the Peoria Hospital for she was living there in the 1940 census. 9. Nellie Lillie Bateman was born 18 January, 1882. In the 1910 U.S. Census there is a Thomas A. Skeels and his wife is Nelle. They are living in Blue Ridge Twp., Piatt Co., Illinois and they have one child, Charles R. age 2. Thomas was born about 1881 in Illinois. Nelle indicates she has one child born and one living. Thomas is a teacher. Written by Nelle’s name is the word “music” for an occupation. They may have had other children: Eldon, Bernardine and Raphael. 10. Edna Bateman was born 3 March 1884 and died August 1977. She married Herbert Warren of Elwell, Michigan and had Ralph and Lola. UPDATE: Edna Bateman is buried in Mount Pleasant Cemetery, Van Wert Co., Ohio. Find A Grave has her tombstone #32902048 and her name as Edna Warren Robey with links to two husbands and one child. Herbert James Warren is FAG#21450927 with links in the Mansfield Cemetery, Piatt Co., Illinois. Her second husband was Wm. Quinn Robey #33194986 FAG. Thanks to a cousin M. West. 11. Harry Brown Bateman was born about 1887 and died 1962. He married Jessie Weedman born 1886 and died 1967. They had Philip, Amos, Jack and Richard. Thomas and Elizabeth Brown Bateman are buried in the Mansfield Cemetery in Mansfield, Piatt Co., Illinois. Find A Grave has pictures of their tombstones. Pioneer Called – Thomas Bateman Passed Away at his Home Monday Evening, A Blue Ridge Early Settler. Thomas Bateman was born June 18, 1837 in county Cork, Ireland. His parents were Samuel and Jane Bateman who reared a family of ten children. Moved by the spirit of the mighty emigration which has directed so many million of the old world’s population toward the brighter promises of success and happiness in the new, his parents came to America when Thomas was but a lad of 13. Fifty six years ago, the ocean was much wider than now, especially to the poor emigrant, and the voyage made in a sailing vessel, lasted six weeks. They settled in Ontario near Toronto where they lived for 21 years. Here Thomas worked for four dollars per month to help in the daily support. On Nov. 3, 1864 at the age of 27, Mr. Bateman was joined in marriae to Miss Elizabeth Brown, also of Canada. In 1871 with his wife and….missing parts – They lived in the home of their ___the father _____On coming to this state he bought land on Blue Ridge where he has made his home for thirty five years, known and respected by his neighbors for his uprightness of character. To him and his faithful wife were born a family of 11 children who honored and comforted him while he was living and now cherish with tender regard his memory in the hour of death. They are Thomas, Mrs. Jennie Smothers, Mrs. Mary Chase, Samuel, Charles F., John R., Mrs. Lizzie Smith, Etta, Mrs. Nellie Skeels, Mrs. Edna Warren and Harry B., all of whom reside in the vicinity of the old home except Mary Chase, who lives in Okla., and John R. in Rocky Ford, Colo.
From this large family circle the father is the first link to be removed by the hand of death. After a physical decline of several years, a fatal illness laid hold upon him some four weeks ago and on Christmas Eve, there came a swift summons from the skies and without a word the spirit of our brother departed for the eternal home at the hour of 7 o’clock. By industry and business ability the subject of this brief life history was enabled to accumulate considerable property; the home place of 200 acres being one of the tiniest country homes in the community. He was the last survivor of the old settlers in this neighborhood. His early education was received in Ireland and he was reared in the communion of the church of England. Some fifteen years ago he united with the Methodist Episcopal church at Lindsey Chapel. Mr. Bateman was strictly honest in all dealings with his fellow-men kind to his family considerate of their welfare and in short, honorable in every relationship of life. Besides the wife, children and grandchildren there survives him, one sister Mrs. Bessie Tanner, 80 years of age, residing in Canada. These with other relatives and many friends mourn his sudden departure. Funeral services were held Thursday at 11 o’clock a.m. at the home, conducted by Rev. Gooding assisted by Rev. McGhee. A large number of relatives and friends attended the services and followed the remains to Blue Ridge cemetery for interment. The widow and children have the sympathy of all in this affliction. The people of the village were thrown into a state of excitement Saturday morning, when the news spread about town that Mrs. Elizabeth Bateman was fatally burned when her clothing caught fire while burning trash at the rear of her home on south street. Mrs. Bateman and her grand-daughter, Miss Lee Bateman went to the rear of the lot to burn trash. After working a while, Miss Lee returned to the house. In a short time Mrs. Bateman’s clothing caught fire and she rolled on the ground in an effort to extinguish the flames. She was first seen by Paul Albert Vaughan, a neighbor boy, who gave the alarm, but before help could arrive her clothing was almost burned from her body. She was carried to the house and medical aid summoned but she was so badly burned that death relieved her of her suffering about 3 o’clock in the afternoon and was conscious until the last. A verdict of accidental death, caused by burning was returned by a coroner’s jury Saturday evening. Elizabeth Batemen, daughter of Thomas and Mary Brown, was born at Sterling, Ontario, Canada, July 6, 1848, and died at her home in Mansfield, Illinois, March 31, 1923 at the age of 70 years 8 months, and 25 days. Mrs. Bateman was one of a family of four children, and was but five years of age when her father died. She grew to womanhood in her native land, where she received a common school education. She was married to Thomas Bateman, also of Canada, Nov. 3, 1864, where they continued to live until 1871, when they with their four children moved to Illinois. Soon after their arrival they purchased a farm in Blue Ridge Twp. where their son Harry B. now lives. Here they settled and reared their family of eleven children, who are as follows: Thomas, near Farmer City, Illinois; Mrs. Jennie Smothers and Harry, of this vicinity; Mrs. Mary Chase of Toukawa, Oklahoma, Samuel of Clyde, North Dakota; Charles F, deceased; John R. Bateman of Breckenridge, Michigan; Mrs. Layton Smith, VanWert, Ohio. Mrs. Edna Warren, Elwell, Michigan; Mrs. Nellie Skeels, Villa Grove, Illinois and Miss Etta at home. Mrs. Bateman was brought up in the Episcopalian faith, but upon their coming to Blue Ridge, united with the Methodist Church of Lindsey Chapel, where the family regularly attended during their residence there. She still retained her membership in that church at the time of her death. Mr. Bateman died at the old home, December 24, 1906. Soon after his death, Mrs. Bateman purchased the home on South street where she was living at the time of her death. Mrs. Bateman possessed a kind and cheerful disposition and had a large circle of relatives and friends. She leaves ten children, thirty-two grand-children and thirteen great grandchildren to mourn her departure and were all in attendance at the funeral except Samuel and Mrs. Nellie Skeels. She will be greatly missed in the home and community. Funeral services were held at the ME. Church ___ o’clock Tuesday morning. The Rev…..Evans _________the pall bearers were W.H. Firke, J. J. Swartz, J.B. Douglas, Bert Howe, J.J. Warren and John Gardiner. The flower girls were the Misses Agnes Bateman, Beulah Walker, Mary Bateman and Daisy Bateman. The large attendance at the funeral and the bountiful floral offering ___of the high esteem in which the deceased was held in the community. At the close of the service, the remains were laid to rest in the Mansfield cemetery. There is a lot more information and research to be done on this family but I feel that this is a good summary of the Thomas and Elizabeth Bateman’s Family. There would be estates, deeds, more census research done on the children, cemetery searches and other research to be done to complete the family. Because there are many living descendants of Thomas and Elizabeth (Brown) Bateman in Illinois, I have chosen to do a summary of the information that was shared with me by my cousin Bob Hayes a descendant of Matilda Brown Clements daughter of George Brown brother to Elizabeth’s father Thomas. If you would like more information please leave a comment. This entry was posted in Bellflower McLean Co., Blue Ridge Twp., Elizabeth Brown and Thomas Bateman family, Farmer City, Farmer City Cemetery, Hastings Co., Illinois, Ireland, Mansfield Cemetery, Maple Grove Cemetery Illinois, Mary Johnson 1820 to circa 1886, Michigan, Ohio, Oklahoma, Piatt County, Pritchard Cemetery Michigan, Rawdon Twp., Stirling, Thomas Brown 1810 to 1848, Tonkawa IOOF Cemetery Oklahoma, Updates and Corrections, Woodland Cemetery Ohio and tagged Canada to Illinois, Chase surname, County Cork, Illinois genealogy, Ireland, Piatt County History, Skeels surname, Slater surname, Smith surname, Smothers surname, Warren surname, Watson surname, Weedman surname on April 24, 2015 by BJ MacDonald.